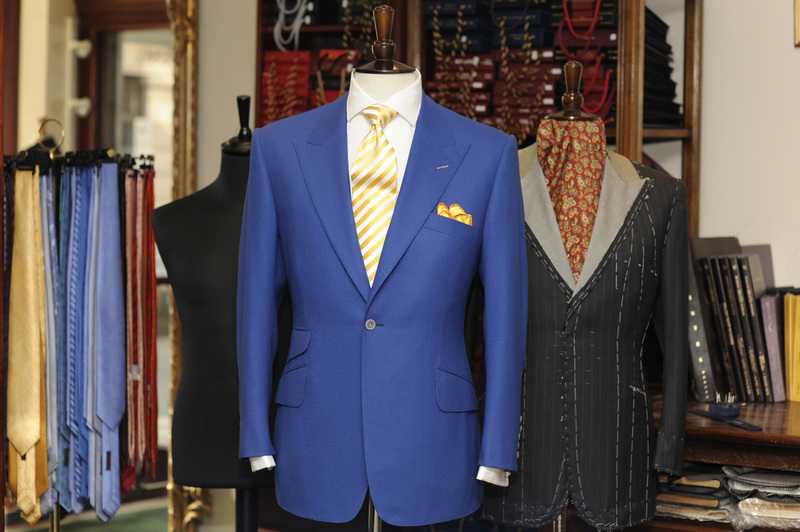 From the choice of cloth through to such details as the number and positioning of pockets and the shape of lapel, the customer has the freedom to design the suit or garment which will meet his or her needs. This responsiveness to the client's requirements coupled with the benefit of our experience produces optimum results. For us, there is a big distinction between "good" and "perfect". 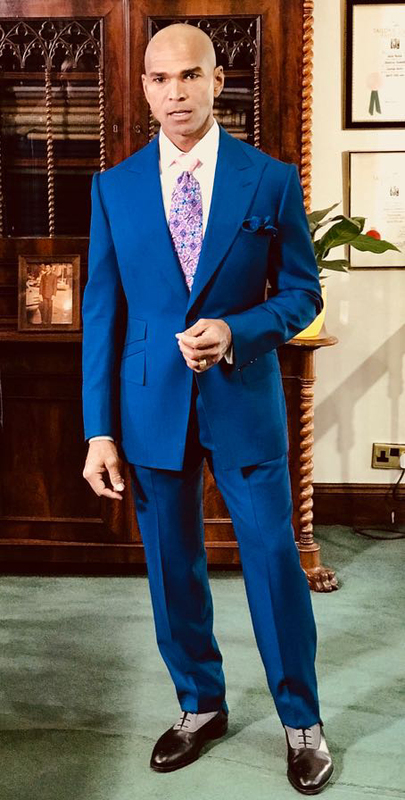 It is of paramount importance that we are entirely happy with the end product and the customer is confident in his, or her, sartorial presentation. To achieve our level of perfection every customer experiences a three stage fitting process - the transition from cloth to suit. 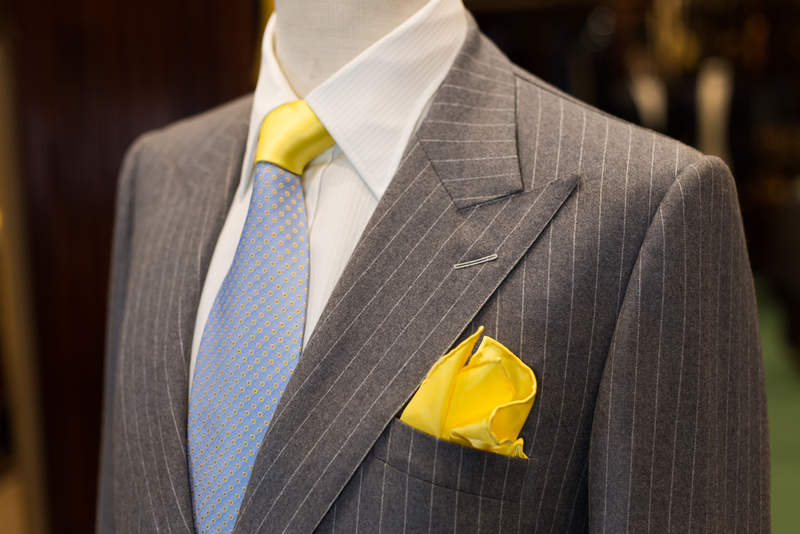 Your suits and garments are created from the finest cloths in the world, 80% of which are British. Select from an extensive range of cloths suitable for all occasions; different colouring, patterns and weights, all woven from natural fibres including vicuna, cashmere, pashmina, mohair, silk and lambs-wool. Having ascertained the use of the suit, style features and the best cloth, measurements are taken and figuration recorded. The skeleton fitting then takes place. 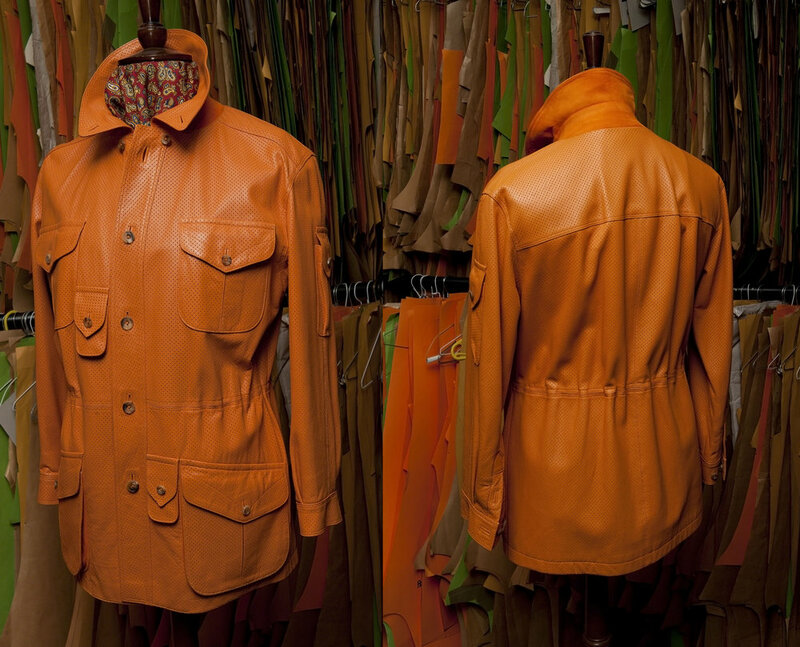 The jacket seams are opened and moulded onto the customer to ensure a comfortable fit in harmony with his or her figuration. A master pattern is then constructed. Only after this stage has been satisfactorily reached does the actual tailoring begin. The canvas inter-lining and chest piece are hand-padded to establish the foundation of the garment. Soft structured tailoring ensures the garment stays in perfect shape for the rest of its life. After the pockets have been made the lapels are established and the sleeves inserted. The forward fitting then takes place. By the advance fitting, some 90 hours of highly skilled labour have elapsed. Now the suit is nearly ready, but a final check is vital to ensure perfection. It is now that all the tiny stitches come together in a dashing picture of sartorial elegance. 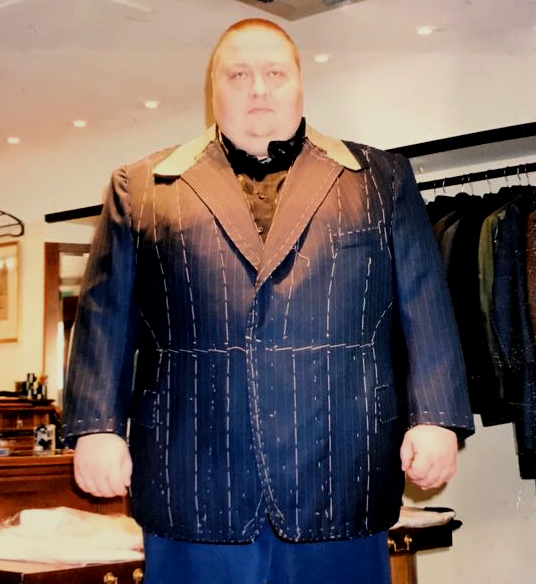 When the client returns to collect the suit, it is tried on for final approval. We enjoy our record of total customer satisfaction which we cherish and aim to maintain. 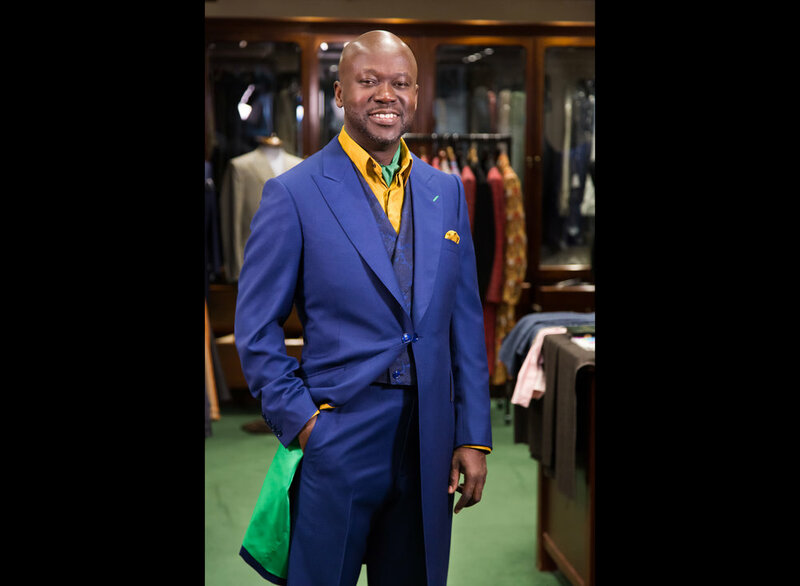 Master Tailor Andrew Ramroop surprises David Adjaye OBE with a Ghanaian flag lining to his Ultra Bespoke suit created for his investiture with Her Majesty Queen Elizabeth. Established in Fleet Street, London in 1938, Maurice Sedwell went on to win the Gold Medal from the Tailor & Cutter Academy competing with the best tailors in the land. Thereafter it was a natural progression to Savile Row and in 1963 the company moved to No 9. Then, as now, there was no flashiness, just unremitting quality, style and elegance. Today this reputation is as solid as ever; politicians, captains of industry and international business people from all over the world make their way to Maurice Sedwell with the knowledge and comfort that they will be dressed to perfection. In 1994 Maurice Sedwell Ltd. expanded into elegant, larger premises at No 19, in response to the increasing demand for our services. We are justifiably proud of our hard-earned reputation for excellent client care. Our precise, all-round service and meticulous attention to detail is what endears us to our clients, many of whom return time and time again. Our commitment to the ideals of exacting craftsmanship coupled with customer service resulted in our referral to, and subsequent membership of, The Guild of Master Craftsmen. We became the first Savile Row tailor to receive the Guild's accolade for Quality & Service and their Armorial Bearing for Skill & Integrity. 2018: Speaker at UK Black Business Show. 2016: ExporTT Conference Keynote Speaker, "Developing a World Class Fashion Business"
"The Queen has been graciously pleased to give orders for appointments to, the Most Excellent Order of the British Empire: O.B.E. to Professor Andrew Madan Ramroop, Savile Row Tailor. For services to Bespoke Tailoring and Training." 2008: Opening of Savile Row Academy at Maurice Sedwell - landmark initiative opening of the the first centre of learning for aspiring Savile Row tailors. 2007: National Training Award Winner. 2005: Winner - Best Men’s Wear – Design, Cut and Fit: Golden Shears Competition: Apprentice tailor Verena Unger. 2005: Chaconia Medal Gold: Hon. President of the Republic of Trinidad & Tobago – Distinction in Tailoring and Business. 2005: United Kingdom Representative at the World Congress of Master Tailors – Berlin, Germany. 2004: Winner – Excellence Award, Made in London – London Development Agency. 2004: Professor – Distinction in the Field of Tailoring – University of the Arts London (conferment) Andrew Ramroop. 2002: W E B Du Bois Institute, Harvard University honours graduate for Outstanding Contribution to Faculty inaugurating annual Andrew Ramroop prize. 2001: Represented United Kingdom at the World Congress of Master Tailors, Paris, France. 2001: Winner – Black Enterprise – International Businessman of the Year. 2001: Winner - Men of Merit Award. 1998: BBC Documentary: Black Firsts. 1988: Purchase Maurice Sedwell Limited becoming the first person of colour to own a Tailoring House in Savile Row. 1956: Winner: Tailor and Cutter Academy Gold Medal – Tailoring Men’s Suits. Mr. Maurice Sedwell competing against the finest tailors in the UK.